With timely repairs and maintenance, a flat roof can last over 40 years before needing to be replaced. 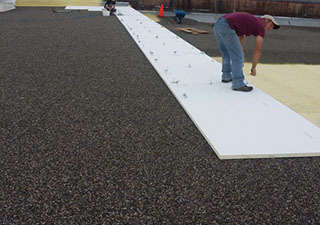 Here at Empire Contractors, we offer flat roof repairs and more to clients in Grand Rapids, MI. You can trust us to handle all types of commercial roofing services that will help you get your money’s worth out of your existing roof. For a free onsite roof evaluation, give us a call at (231) 578-4760. Empire Contractors has been around since the late 1990’s. Our roofers are professionally-trained and always hold the proper licenses and insurance. With over twenty years of experience working on commercial roofs, we know what it takes to provide long-lasting solutions. At Empire Contractors, we’re known for our ability to make a building more energy-efficient through green roofing solutions. We offer environmentally-friendly roofing systems like TPO single-ply roofing. This white membrane reflects the sun which lowers your energy costs significantly. The same can be said about our roof coatings. Speaking of roof coatings, if you’re here because you need a flat roof repair, it may be time to restore your flat roof. By restoring your flat roof with a roof coating, you won’t need to worry about leaks for years which saves you both time and money. This affordable service can prolong the life of your roof by over a decade. As time goes on, you can always get your roof recoated. Before deciding you need a roof replacement, learn more about the advantages of roof restoration! The experienced roofers at Empire Contractors are not just experts at flat roof repairs but also roof leak detection. Pinpointing the leak on a flat roof can be difficult. The last thing you want is to pay for a repair only to find that your roof is still leaking. 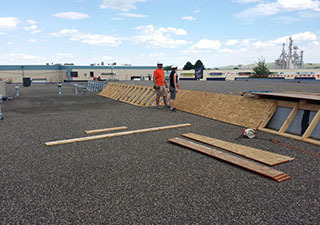 When you hire Empire Contractors, your flat roof will be properly diagnosed and fully repaired the first time around. When you need a flat roof repair, it’s time to call Empire Contractors at (231) 578-4760. We provide roof repairs, restoration, and replacements to clients in Grand Rapids, MI. Our team looks forward to forming more longterm business relationships with local clients!